Book Synopsis: Tara Sharp has a rather unusual gift, one which she considers a curse. She can read people, in particular their auras. She can read their emotions, and given she sometimes has trouble keeping her mouth shut, at times this almost renders her unemployable. Her parents despair of her holding down a job, and send her to a family friend for counselling. Tara is surprised and nonplussed when the counsellor sends her on her way, advising her to visit a body language and psychic business. At a loss, Tara follows her advice, and meets Mr Hara, who takes her on as a student in exchange for her doing some work for him. He explains about proxemics, kinesics, and has a laminated chart explaining what aura colours mean. 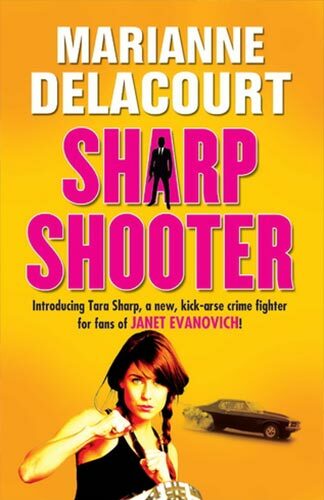 It will be difficult for Sharpshooter to avoid comparisons to the Janet Evanovich series – it even says so on the cover – but Sharpshooter is undeniably Australian, and Tara Sharp smart and funny. While she rushes at life wholeheartedly, she does not seem to feel the need to bowl it over like a Labrador puppy, getting into ludicrous situations as she does so, which is the rather wearying trend of many similar heroines. She is keen to make money, but doesn’t completely rush into situations blindly. Delacourt has surrounded her with a variety of original characters – an upmarket mother-of-three female best friend and a gay male best friend; a narcoleptic side kick she doesn’t really want but who attaches himself to her; and realistic parents, who worry about her and annoy her, but who she loves and they love her. Oh, and a pair of excitable galahs who play a critical part in the novel. Sharpshooter is the first in a series, a welcome addition to the comedy caper crime heroines, especially when pulled off with such aplomb. Delacourt is a refreshing new voice in crime fiction, whose aura-reading PI makes her presence felt. It was also an invigorating change to have a PI novel set in Perth, which was brought to life so strongly in Sharpshooter. Delacourt is able to bring a real sense of her town and its inhabitants into strong focus in the novel. She clearly has a strong affection for the town where she grew up. Marianne Delacourt is the alter ego of S F writer Marianne de Pierres. Sharp Shooter introduces Tara Sharp a fun, feisty kick arse crime fighter who drives a Monaro when she really wants a Lamborghini. Tara has a gift that often gets her into trouble, so she seeks out Mr Hara “a petite, smooth – skinned Euro Japanese gentleman” with an aura of canary yellow laced with purple flecks. Short of money Tara rejects her reading of shady lawyer and only hears bonus and retainer. This decision gets her into more than a heap of trouble. Her Monaro is sometimes of great assistance but very conspicuous in the dark parts of Perth. Sharp Shooter is fast and funny with a twenty something heroine who is out for fun and sleep. Let’s hope we see more of Tara and her auras.